Expected to be announced on October 27 alongside the Droid Maxx 2, the Motorola Droid Turbo 2 is not one of Verizon's best kept secrets. We've already seen various leaked photos of the handset, plus one of its wallpapers, and now we can also take a look at some accessories made for it. Images showing these accessories (two protective cases and two screen protectors made by Qmadix) also reveal renders of the Droid Turbo 2 itself. These new renders seem to be confirming the fact that the Droid Turbo 2 has a front-facing camera with flash (just like the Motorola Moto X Style / X Pure Edition), while its bottom front speaker is split in two. It's said that the Turbo 2 features a 5.5-inch Quad HD display, an octa-core Qualcomm Snapdragon 810 processor, 3 GB of RAM, 32 GB / 64 GB of storage space, and a pretty large 3760 mAh battery. While Verizon will be the exclusive carrier of the Droid Turbo 2 in the US, the smartphone should be available in other markets as the Motorola Moto X Force. So, who's waiting for it? So Motorola just tossed us the appetizer while Verizon gets the main course? Motorola does it again. What do you care Mxyzptlk. Everyone knows you only like Apple, and you always troll anything to do with Android and Google. The only difference between this and the Moto X pure/Style is the battery and the thickness. Other than that, if they can keep the price close to the $400 mark for an off contract price. Then Verizon customers will be happy. Give the guy break. He's not pro-Apple, he's a Motorola critic. You've all got him wrong. I think he's just waiting for his perfect Moto device, but everything they've released of late has some niggling flaw. However, this Turbo 2 is not clearly better than the X Pure. The design is clunky, the bezels are pretty big, and the SD810 is suspect. I would skip this and stick with the Pure, even on Verizon. I would do the same. The Pure has a more sleeker design and isn't chunky or awkward looking. Kind of wished the Pure had thothose Kevlar backs though. I'm not even sure the Turbo 2 has Kevlar. It looks like some kind of waterproof rubbery substance, but I don't know what it is. So if we agree that the Pure is the better, or at least more attractive, device, why keep up the critique that Motorola screwed everyone not on Verizon? I guess I was going off of last year's model of the Turbo. I just wished in general Moto Maker offered the Kevlar backs. I would pay the extra $25 for that. 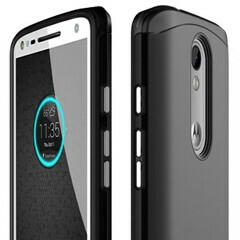 I have the Droid Maxx with its mostly full body Kevlar, and I wouldn't call it a must-have. It feels nice, but that's because of the soft-touch plastic covering it. It's kind of a gimmick. I'm not expecting my phone to take a bullet, and if it falls on a corner or the screen, it'll still take damage. Have you felt the silicone backing on the X Pure? Now that's some nice grippy stuff. I've had a chance to see what it felt like quite recently. I was able to speak to a vendor who was putting it on display a Best Buy. Much nicer than I thought. Definitely had a nice grip to it. Hmm there are a lot of tempting phones this year, moto x pure, nexus 6p and lumina 950XL. Not enough phone lines to get all of them. Now as far as I know I am getting the Lucia 950XL but still debating in the next android I will get I am between the 2 mentioned. It won't be $400 retail from Verizon. I predict the Maxx 2 (X Play) will be $400, the Turbo 2 $600. What do I care? Well not for anything you say. You're obviously misinformed, again, so learn to actually READ my comments. You sound like you are. You don't like the SD 810 chip, but then get mad when Motorola releases a phone with it and it's exclusive to Verizon. I think you are extremely butthurt. Well you are always on my case. I think you are butthurt. I wouldn't say butthurt, but he has a point about the SD810. You were very much against that chipset, yet Motorola is screwing customers by holding it back for Verizon. So which is it? I was speaking in general. I'm aware of the chipset being used. It's just that it's going to have a beefier battery and assuming it will have a Kevlar backing. See above. It is possible to have a civil conversation with Mxy if you don't start out attacking him. I've given up trying to have a civil conversation with him. I'm better off having a civil discussion with a chimp. 3 and a half years ago, post 7, you're trolling Samsung, Verizon, Motorola and LG in a single statement. You've been trolling for YEARS... I'm simply calling you out on it. http://www.phonearena.com/news/Verizon-knocks-a-third-off-Galaxy-Nexus--just-199_id29396 I'll treat you with respect when you start behaving respectful. It's as simple as that. There's your problem. You're treating him like the troll he was three years ago. It took me a while to figure out, but Mxy is not your standard pro-iPhone anti-Android BobbyBuster type. He trolled Moto because they really have screwed up over the years. Now that they're making phones with owning, he's paying even more attention. These days, I'd rather talk to Mxy than a blowhard Samsung fanboy like TechieXP. No, my problem is I've asked him numerous times to behave respectfully towards others and he's unwilling to do that. In the years he's been on this site, he has never changed. His intent on this site it to cause conflict. I'm simply not standing by and keeping quiet. I'm not going to respect others if they're going to be bashing my platform or if they're going to trash talk. You're just trying to cause conflict. I've figured you out Scott. You're a big hypocrite. As you can see above I am quite capable of having a reasonable discussion. That comment I made was three years ago. Get the f- over it. Dude, every comment you've made since then is trolling. He's far from the worst offender in the comments these days. I agree. He sits here and acts like I'm the worst offender yet he says nothing about the apple trolls. Get over it. If you want to get salty because someone has an opinion then get off the internet. +1. I have had more experience with Motorola devices with the Droid being one of my first smartphones. I give credit where credit is due. Scott is just being a huge dk here.